A newer commentary series that I am really excited about is Zondervan's Exegetical Commentary on the New Testament (ZECNT). The features of this commentary series that I am most excited about include the discussions on the literary context, the identification of the main idea, the graphical (or structural) layout of the author’s translation, and theology in application. All of these features are valuable for preachers and teachers interested in doing serious exposition. 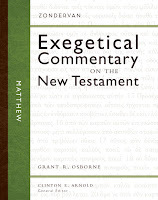 One of the most recent volumes in ZECNT is Grant Osborne's commentary on Matthew. My initial response to receiving the commentary is "this is heavy" (literally). The book is 4.5 lbs. and clocks in at 1,152 pages. Having read Osborne before I should not be surprised. Another initial observation which should not be surprising to those familiar with Osborne's work in hermeneutics is that he begins the commentary with seven pages on how to study and preach Matthew. This is well worth reading.